APA (American Psychological Association) citation style is a set of guidelines that explain how to properly give credit to the books, articles and other resources you used in a paper or assignment. 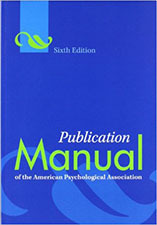 This guide is based on the Sixth Edition of the Publication Manual of the American Psychological Association (sometimes just called the "APA Manual"). This guide covers the most common types of citations that college students use but for more examples and explanations you might want to check out the original book. A copy of the handbook is kept at the Reference Desk on the second floor of the library. Please ask the librarian if it's available. This guide was based on the APA Citation Guides created by the Online Writing Lab at Purdue University, the blog at APA Style Blog and the blog at EasyBib.com. Icons were made by Freepik from www.flaticon.com.